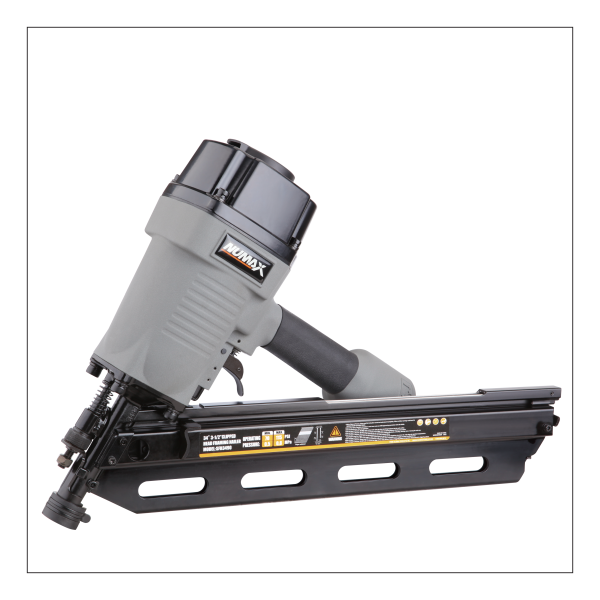 The NuMax SFR3490 34 Degree 3-1/2″ Clipped Head Pneumatic Framing Nailer provides cost effective speed and power for handling any project involving framing, remodeling, subfloors, sheathing, roof decking, fencing, pallet and crate assembly, furniture manufacturing, and truss work. This air powered framing nailer is compatible with 10-12 gauge 34 degree paper collated clipped head framing nails from 2″ to 3-1/2″. A simple pull-back pusher makes the magazine easy to reload when the anti-dry-firing threshold is met, designed to reduce damage on internal components and extend the life of the air powered tool. The dual mode trigger allows for bump or sequential firing, and the no mar safety contact tip eliminates damage to your work surface. The durable magnesium body and aluminum cylinder create a rugged and lightweight nail gun ideal for use over long shifts. A comfort grip handle helps reduce fatigue while increasing control and accuracy of nail placement. The tool-free depth adjustment is controlled by simply turning a wheel below the trigger with your finger. An air filter / anti-dust cap keeps internal components free of dust and debris. Air tool oil and adjustment tools are included. 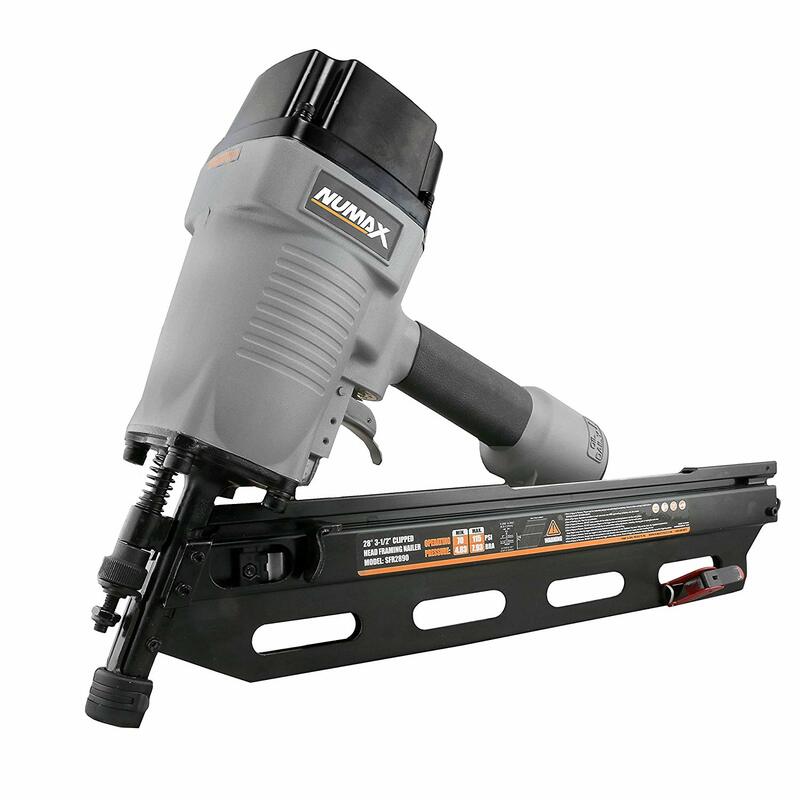 The 34 Degree 3-1/2″ Clipped Head Pneumatic Framing Nailer will make home improvement and repair work fast and easy for DIYers and professional construction contractors at the job site, and is covered by NuMax’s 1 Year Limited Tool Warranty and 30 Day Wearable Parts Warranty. 20.38" x 5.63" x 13.75"
10 – 12 Gauge 34 Degree Paper Collated Clipped Head Framing Nails from 2" – 3.5"